Why do people build tall buildings? For one, it is aimed at maximising the use of the area of land on which it stands. Huge buildings like modern skyscrapers can house a lot of people, almost like a little micro-city with vertical main streets in the form of stairs and elevators. I can understand that. But what about this mine is bigger than yours contest that has been going on between countries and continents ever since who knows when? If you look at the top 10 tallest buildings, some of these stand on land where space is not an issue yet. But in cities cramped with millions of people, taller building probably is the better option. Anyway, just to update, Australia is set to build the tallest building in the southern hemisphere that would involve A$600 million (approx. RM1.95 billion) in investment. MELBOURNE: Australia’s second-largest city Melbourne could possibly have the tallest building in the southern hemisphere after approval yesterday for a new 388-metre apartment and hotel complex. 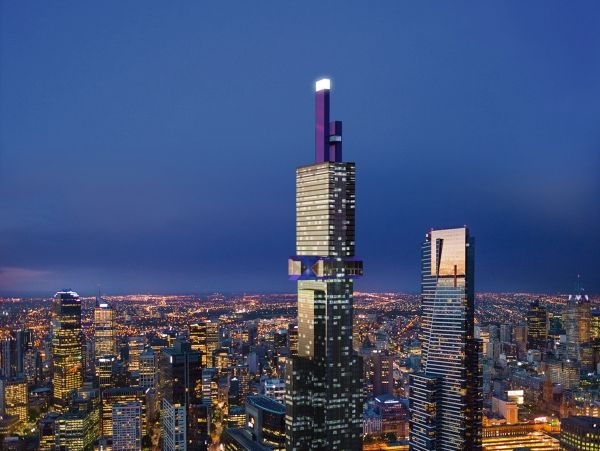 The Victorian state government said Australia 108 would become the world’s 19th tallest building on completion and would be “an outstanding addition to Melbourne’s skyline”. “I am proud to approve a tower that will define our city for many years to come,” Planning Minister Matthew Guy said. There were some concerns that the construction of the 108-storey tower in the city’s Southbank area, expected to be ready in five years, would cast a shadow over the Shrine of Remembrance war memorial, one of the city’s best-known landmarks. But Guy said the trustees of the shrine did not object to the proposal which he said was a A$600 million investment in the state economy that would create 300 jobs in construction and hospitality. Architect Nonda Katsalidis said the tall, slender building which will have 646 apartments, a 288-room six-star hotel plus retail and office space, was designed to throw a spotlight on the city’s international identity. “We don’t have an Opera House (like Sydney) but we have AFPa complex culture and all those ideas were thrown into this project,” Katsalidis told ABC radio. “The hotel at the top is designed as a starburst. We took the inspiration from the stars on the Australian flag,” he added. The world’s tallest building is Dubai’s Burj Khalifa at 828 metres high while Europe’s tallest skyscraper, the Shard in London, stands at 310 metres. The current tallest residential building in the southern hemisphere is the Q1 tower on Queensland’s Gold Coast in Australia, which soars 323 metres to 71 storeys. But Australia 108 could be trumped by South Africa’s Centurion Symbio City, a 447 metre tower to be built by 2018 near Pretoria.